If there's one man that knows how helmets have changed over the years, it is Ski Hardware Buyer for Ellis Brigham, Luke Watkins, who has skied and boarded around the world. We asked Luke what you need to know about ski helmets before you buy. What are the most popular ski helmets? Despite a whole load of funky colours each year, our best sellers always tend to be black for men and white for women. Maybe people don't really want to stand out. So if you're looking for something discreet, choose black or white. However, it's great to add a bit of flair, and brighter helmets will help you be seen. "It's probably best to buy a helmet in person rather than online, there's nothing quite like trying them on. Different brands often suit different head shapes, so you may need to try on a fair few helmets before you find the right one." It's probably best to buy in person rather than online. There's nothing quite like trying them on. It's a bit like a pair of boots - you will know the one for you when you put it on. Of course there are adjustable chin straps and adjustment systems to make it fit better, but you know when you put it on if you're are going to be happy wearing it. That's the most important thing: if you are not comfortable and don't like it, you won't put it on day after day. Different brands often suit different head shapes, so you may need to try on a fair few before you find the right one. Different ranges also have different ways in which they fine tune the fitting, and you can also customise some helmets by taking off the removable ear pads for instance, or adding or removing lining. Play around, and if you are having problems, ask the shop assistant: they might well know the best one for your head shape straight away. Is there a trick to trying a ski helmet on? Yes, you need to put it right down on your head with the front down towards your eyebrows, covering your forehead. You should be able to see the rim if you look up and have just a bit of space above your eyebrow line. So many people try it on and it's half way up their heads - it's not going to do much good that way! What's an ideal ski helmet if you don't want to invest a lot of money? This Raider by Anon, is a multiuse helmet - you can cycle, skate and ski/snowboard with it. Boarders often favor this style. It's made in a simpler way, with an ABS hard shell casing and can probably withstand a few slight superficial knocks and scratches. You can see that it's pretty basic and doesn't have a lot of features like adjustable vents, but it's extremely good value, especially if you're not sure if you'll be skiing again. The downside, though, is that it is a little heavier than some other helmets that use different construction methods. 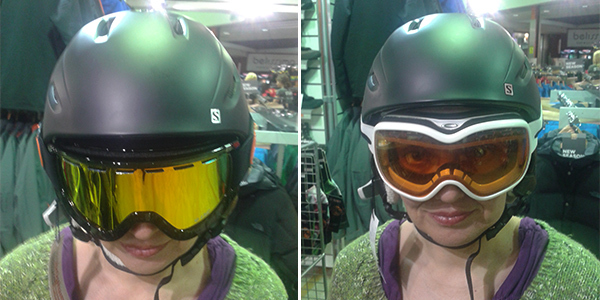 What if I want to buy a light ski helmet? 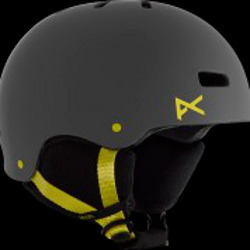 The in-mould injection helmets where the outer is bonded to the inner impact liner are lighter and skiers often prefer these. However, the surface of these helmets does tend to ding and scratch a bit more easily. They also tend to have a more sophisticated fitting system. For instance, the Salomon Ranger Custom Air has a pump system that can get the helmet sitting even more comfortably and Giro use a twist system to fine tune the fit across a lot of their range. What are the latest innovations in ski helmets? 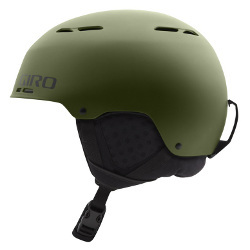 Giro have launched the Combyn which is made of a flexible outer shell and an impact absorbing dual density liner. It flexes around the head, is comfortable to wear and very durable. I see this really changing the helmet industry and is going to be especially good if you have an odd shaped head or take a few more knocks. There is also a new system called MIPS (Multi-directional Impact Protection System) which helps to protect the head from oblique forces. We are also seeing carbon materials being used more, however these are expensive for most consumers. Are children's ski helmets different to adults? They tend to be just smaller versions of adult helmets, but lighter, with some of the features scaled down. It's important that kids don't have too much weight on their heads so they are usually very light. This is actually quite reassuring as you know they are not stinting on safety. Parents do ask if they'll end up buying helmets each year as the child grows, but there's a lot of adjustment in a helmet so it should last a long while. To be honest, children losing helmets is more of a problem! There are also some race specific helmets such as the Head Stivot model, which have hard ears and chin guards. These are usually bought specifically by junior ski racers though who need added protection from slalom gates. How do I try on a ski helmet with goggles? The top of your goggles need to fit as flat as possible against the front of the helmet with just a small space above them for airflow, as you can see with the mirrored goggles here. What you don't want is that tiny slither of skin that you can see with the white edged goggles as this will leave your forehead vulnerable to wind and sun damage. How has winter sports helmet wearing changed? "It's almost the norm to wear a ski helmet now unlike 10 years ago,especially within European resorts." I've seen a lot of changes over the years. I remember the first time I saw these awful bubble shaped things whilst skiing in the states, and I was over in Canada in 2008 when the Natasha Richardson tragedy happened and many people reconsidered the issues surrounding not wearing a helmet. A lot of people bought theirs in response to that but we're now seeing those people come back to us for something more attractive, lighter and modern. It's almost the norm to wear a ski helmet now unlike 10 years ago, especially within European resorts. Can you wear a winter sports helmet after an accident? I have this helmet here as an example of what happens to a helmet when it's involved in an accident. This was worn by one of our ski models on a shoot who went into a tree. It wouldn't have been at a high speed at all but you can still see how the layers have come apart and it's now unwearable. The trip organiser is convinced it saved the highly experienced skier from considerable damage. Over the years we've seen people come into the shop with helmets that have been glued together when they really should have been replaced. It's madness. How should you look after a ski helmet? Be careful if in the loft - keep it well wrapped up. We have plenty of stories of customers who have found mice nesting in their lining! What would you like to see happen in the ski helmet industry? I believe helmets are becoming more comfy, and this is the way to go - people need to want a helmet, not to feel pressured into one. Helmets need to be safe but they also need to be wearable. I'm hopeful we'll keep getting tougher, lighter and more comfortable helmets. Luke Watkins must be one of the few who can claim to have learnt to ski and board in the famous winter sports country of Cyprus. In fact, it fuelled his passion so much that he left University to take up a ski shop sales assistant post that would allow him to teach and board around the world. Luke is now one of the Ski Hardware Buyers for Ellis Brigham.